Of course, I intend to cheat. I just don't have the drive to read 52 books in a year, mostly because I read really slowly and the whole reading-induced narcolepsy. So, again, with the resolve to cheat, I started before 2015, and I read "The Scarlet Letter," which covers like 5-8 of the checkboxes above. It was one of the books I was supposed to read in high school but never actually read. No, not true... I started reading it my 9th grade year and got to the description of the roses beside the jail's door and stopped. Having finished it, I am not terribly forlorn that I didn't read this book sooner. It wasn't nearly as awful as I had assumed but it certainly wouldn't have enriched my teenaged life. With this challenge, I am taking this opportunity to read books I have meant to read for a long time. Right now, I am reading "In Cold Blood" by Truman Capote, and I have "To Kill a Mockingbird" on my list, and "You" by Caroline Kepnes, and of course all the books Stephen King will have written by the time I get to them. You are more than welcome to follow my progress on Goodreads if you'd like. Last year was a terrible year for reading. I read 4 books. FOUR WHOLE BOOKS (not counting The Scarlet Letter... which doesn't count because I said so). It was "Game of Thrones" that killed my usually much higher average. Between finishing writing the first in a series of a kickass science fiction mystery thriller novels in 3 months and editing it, then trying to get an agent to represent that novel (still looking! ), and having my body totally freak out where my hands didn't work for a few months (which seriously makes typing a novel difficult, let me tell you), and my liver and pancreas freaking out from all my horrible medications trying to fix my hands (most of which I am no longer on for the sake of not dying), and having my gallbladder removed, it took me SEVEN months to read the damned book. Just the first book. And it only translates into like the first 10 episodes of the series. I can't read them all. I just can't... until I run out of other things to read and write. I loved it. It was great... but holy crap. It's like the black hole of series. That's not an insult, I promise. It is just SO dense with information. It is wonderful, and I loved it... I really did, but, yeah, I'm abstaining from reading more of the series for the time being as long as I want to do other things in my life. Thankfully now, my hands are working with just one medication and they no longer feel like they have been beaten with a hammer (as long as I remember to take my meds on time) so I can easily hold a kindle or an actual book (since Klout sent me an hard copy of "You" to read) without crying or whining or needing to train Stevie to press the side buttons on my Kindle to change the page for me. So, if you need me, I'll be reading. 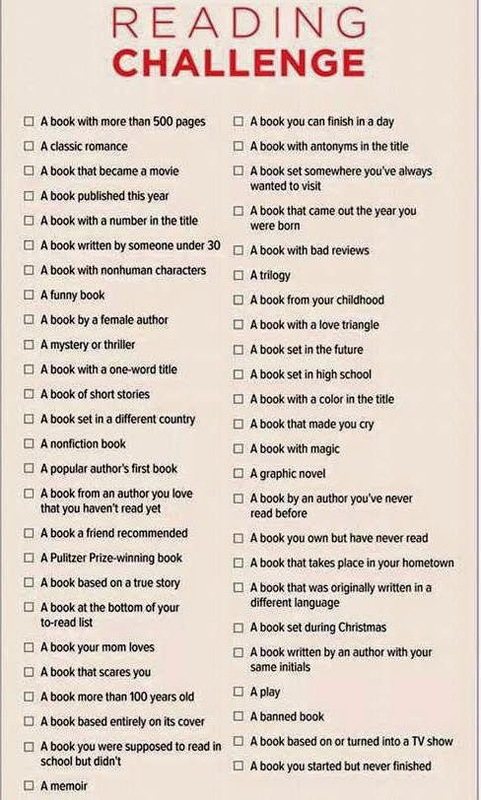 If you want to join in on this reading challenge, I would totally be interested in hearing about the books you're reading, too! In elementary school I read the Harper's Hall Trilogy by Anne McCaffrey. It ticks several boxes. non-human characters, set in the future, made me cry, trilogy, female author, and likely several more. Doesn’t matter if you don’t believe. Yup. Taking time off to read, and apparently write. Finished another novel while taking a break from reading constantly... and revised the first novel. Started a third. And back to reading. I shall be back eventually, I am sure.